Welcome back to The Banner Saga, where the sun never sets, the darkness is coming, and nobody knows if we'll ever get out of this alive. 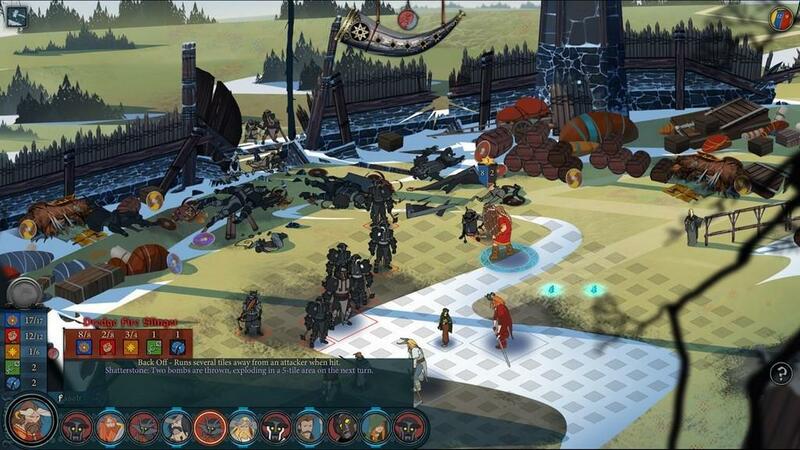 The Banner Saga 2 is the middle game in a planned trilogy. To put it another way, don’t even try playing this second game without completing the first. 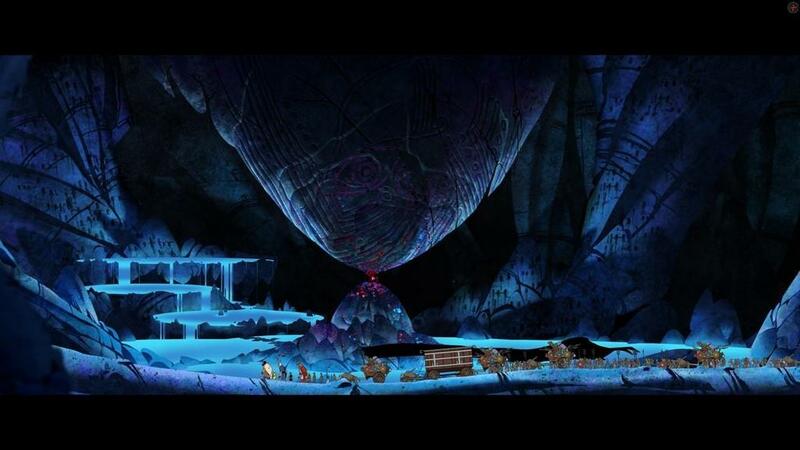 The Banner Saga, as a whole, is a singular epic, beginning to end, taking a displaced people on an apocalyptic exodus. Some games are pre-apocalypse and some are post-apocalypse. But The Banner Saga is apocalypse now. There are a lot of bad things happening at once, and the end of the world just got a whole lot closer. 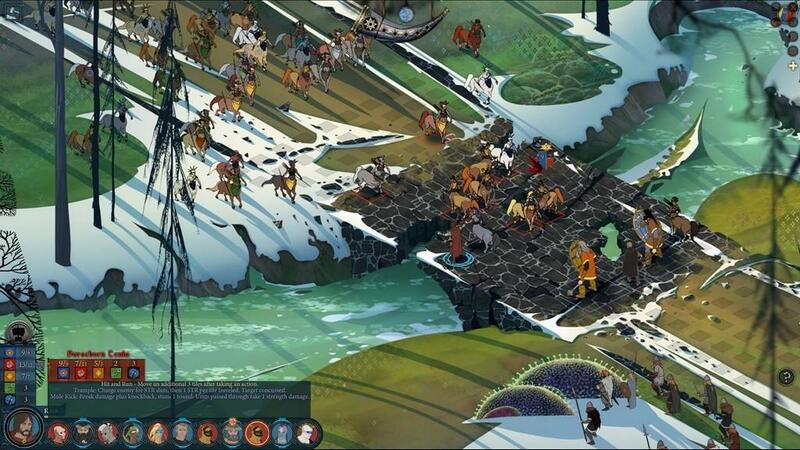 But read our review of the first Banner Saga if you're unfamiliar--or could use a few minutes' worth of refresher--with that world. Scouring the Tolkien-esque map, the land tells stories of struggle. Lakes fished out and polluted, twin cities that would murder one another, woodlands whose flocks have been hunted to extinction. It’s a used-up land. So much picturesque wilderness, yet so battered and bruised at the same time. 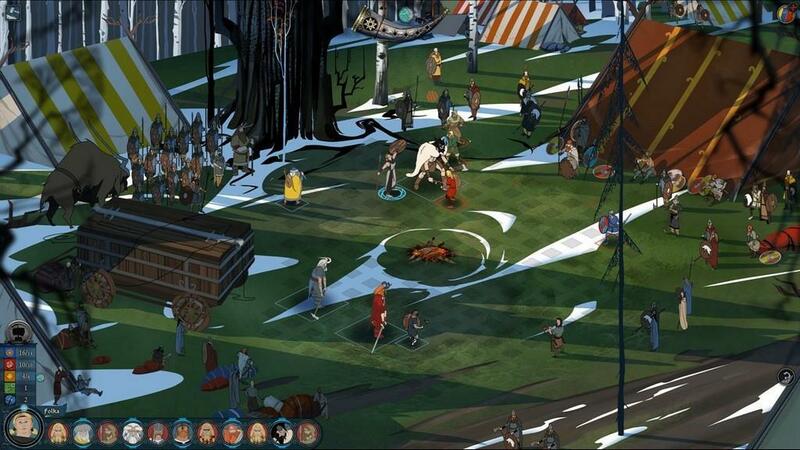 While vaguely taking the shape of The Oregon Trail games, The Banner Saga feels even less predictable now. It’s fraught with more tribal infighting and family struggles than river crossings and dysentery. Nevertheless, in this Nordic high fantasy, you cross landscapes of rolling hills, jagged peaks, and waterlogged lowlands made with still-gorgeous, still-surrealistic brushstrokes. The dredge, your ancient and terrible foe, is still crawling out of the cracks; but now you know they're also just running from the same darkness you're running from. But another species joins this run-for-your-life event: the horseborn. Think nervous centaurs with poison-tipped spears and a donkey kick that knocks an opponent halfway across the board. 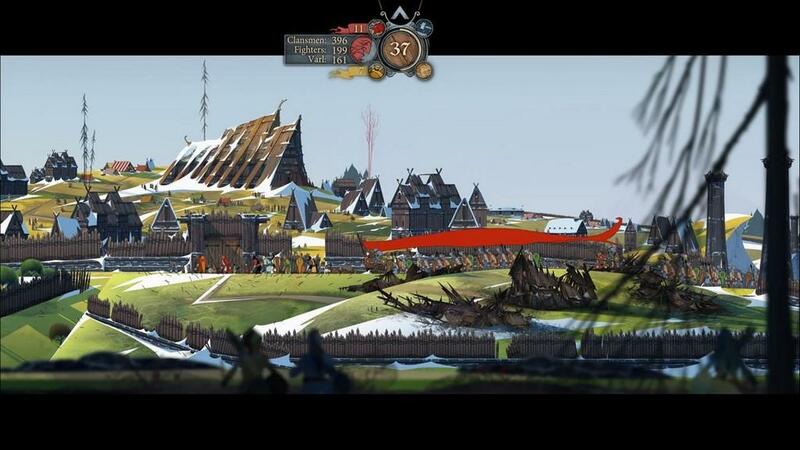 The gameplay is consistent with the first Banner Saga. Turn-based battles punctuate every step of the journey. So, so many battles. Certain decisions made in cutscenes or on the road feel like they can have an effect on events, but in truth, the storyline is largely set in stone. Your journey will (hopefully) bring you to the walled city of Arberrang, where the king will (again, hopefully) bring you into his fold for protection from the advancing darkness. When it comes to the many, many battles, I typically zoom into the field made up of chessboard squares and drag the screen around for a better look at the surrounds. I’m looking, for instance, at a grassy field with four good guys facing four bad guys. I get that much just by staring with tunnel vision at the middle of the scene. But by dragging the mouse around and soaking in some environmental details, I see the Viking longhouse where the good guys set up defenses. I see the strips of venison hung to dry and freeze out in the cold open air. I see the Drakkar ship pulled up to the sharp coastline with goods, goats, and sailors on board. I see the line of arrows punched into the snowy hill, marking where the defenders first started shooting. And I see the bad guys’ women folk standing at a distance, holding their children’s hands, watching the desperate slaughter of their partners and fathers. It’s a complicated scene, and I haven’t even clicked through the first box of text in the tutorial. The most difficult decisions to make as a caravan leader still deal with procuring food for your caravan. I may start with 30 days of food, but what does that mean? What if it’s only 20 days to the next settlement and I have a surplus? What it it’s 45 and my people have been starving for two weeks? Every visit to the market holds the most uncertainty for me. Sure, place me on a battlefield with five of my guys against 10 of theirs--I can pretty much figure out what I need to do. But figuring out how much food I need until our next rest stop? I never know. I was never comfortable making those decisions. Also, while it always seems clear what I need to do on a battlefield to get by, choosing my words in a conversation is another careful, shoot-from-the-hip process. Who am I talking to? A wartime friend? A shaken refugee? Sometimes what I have to say is different than what the other person needs to hear. The dialogue leaves me at a crossroads a lot. 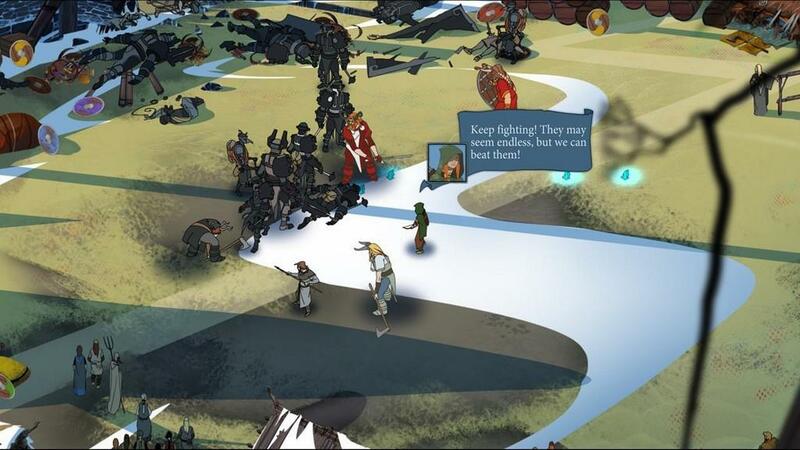 The Banner Saga is fully aware you want to “save scum” your way through the story. You want to save your game before you hit a pivotal point. You want to reload if you botched that last fight, that last conversation, that last stretch that needed three or four more days of food. 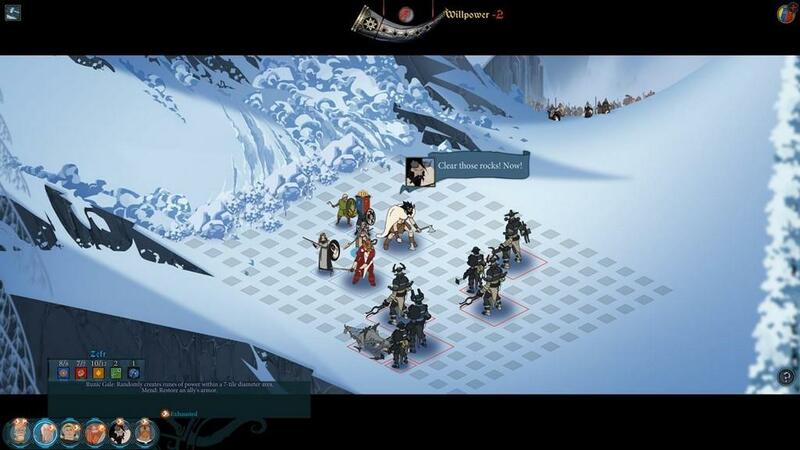 The Banner Saga’s save system is invisible, however, so save scumming is difficult without having to backtrack further than you intended. So just go with the flow. You’re allowed to lose battles; losing battles doesn’t lose the war and certainly doesn’t stop the story’s death march. Just roll with the punches. That's still a jagged pill for me to swallow. In a battle, admittedly, it can be easy to lose track of who’s on whose side. With varl fighting varl, humans fighting humans, and horseborn fighting horseborn, sometimes I have to click on each and every unit to assess who the good guys are versus the bad guys. Regardless, it feels like the fights have a little bit more variation thrown into the mix. It tosses things around, strategically, by changing up starting conditions on the battlefield. Sometimes your forces are split up. Sometimes there’s a checkerboard pattern that forces them apart. Sometimes it’s an ambush and you’re scattered randomly. Sometimes the fields look so torn up that it’s hard to tell if a crack in the ground is impassable or simply cosmetic. War weariness is an issue for me. It’s battle after battle after battle. And the downtime feels like you’re either talking about the battle you had, the battle you’re in, or a battle coming up. Even the character development is often framed in battle talk. But every outcome feels valid, in a sense. Some victories feel hollow. Some losses feel inevitable. One can feel welcome and the other can feel ridiculous, and how you feel at the end of the fight may surprise you. Sometimes, just taking a loss, moving the caravan forward, setting up camp, and getting some rest can feel like more respite than winning at any costs. The music continues to add a drippy, cold, wet underground tremor to your story. There’s a raw, undercooked edge to the violins. There’s even a menacing groan to the accordion music, which is a strange thing to say, I know. Most of the music is a variation on the themes composed in the first game. There’s a little less bite, but it’s still a soundtrack that soars between punchy and lonely, desperate and triumphant. The Banner Saga 2’s finale needed another round of QA. In dialogue, especially. In a culminating scene, one person that cannot be seen at all is contributing to the conversation. Another dialogue tree mislabels who’s speaking exactly. In another instance, a recurring character is missing his right hand, but at some point they mirror-image the 2D illustration of him--so suddenly it’s his left hand that’s missing instead of his right. And this isn't any kind of glitch, but one character's recurring dream imagery looks hasty and cobbled together at the last minute, compared to the masterful compositions making up the rest of the game. The attention to detail started slipping near the end. Nothing catastrophic. They just needed to take a Q-Tip to clean up some of the harder-to-reach areas. Reaching the walled city of Arberrang is the goal. But who you are when you get there is the most important part of the journey. 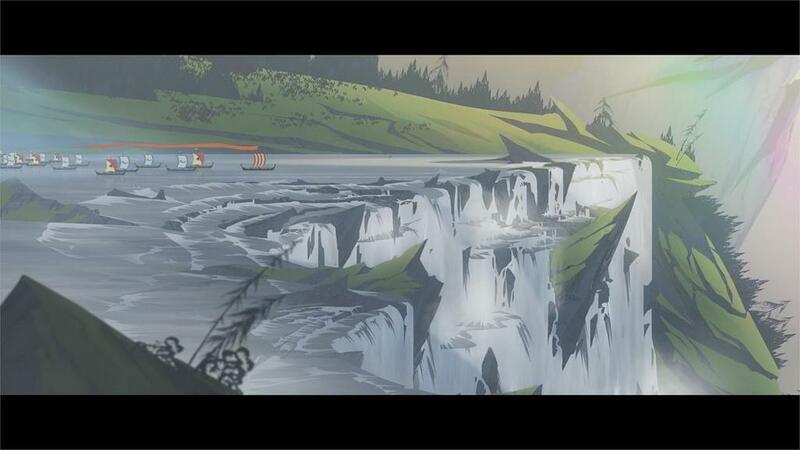 The first Banner Saga felt momentous. 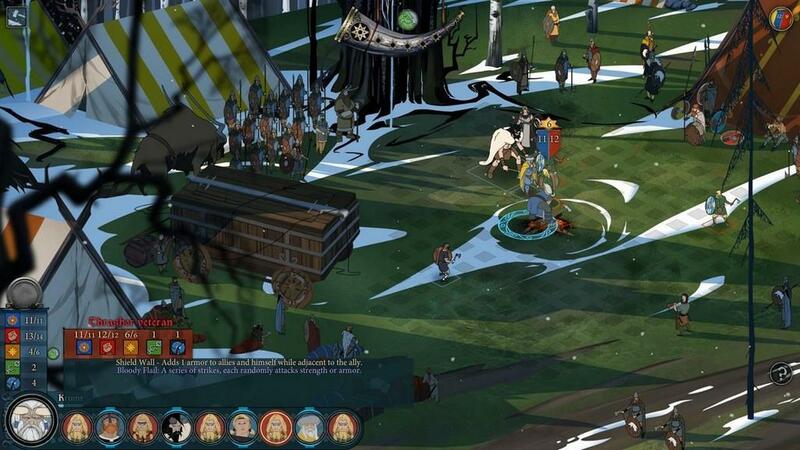 The Banner Saga 2, however, feels relentless and just a little hopeless. Bring on the third act. 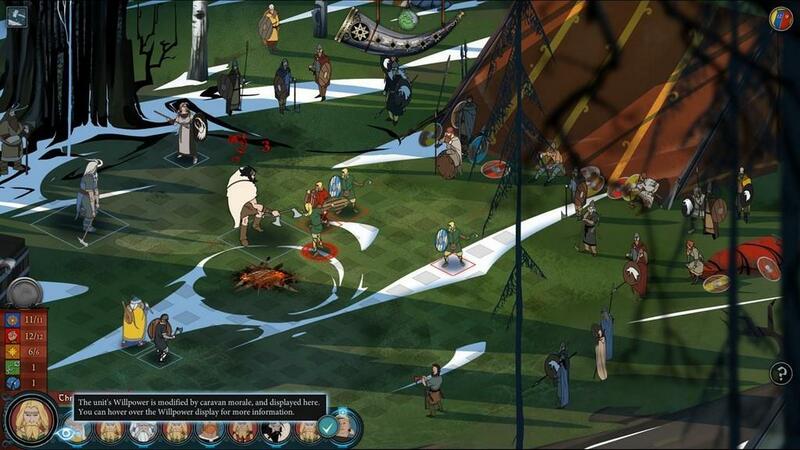 The Banner Saga 2 is like moving through a still-life painting of swords and spears and ice and hunger. A few thoughtful gameplay tweaks make things a little bit better for players, and a whole lot worse for characters. Now I’ve got to see how this thing ends. 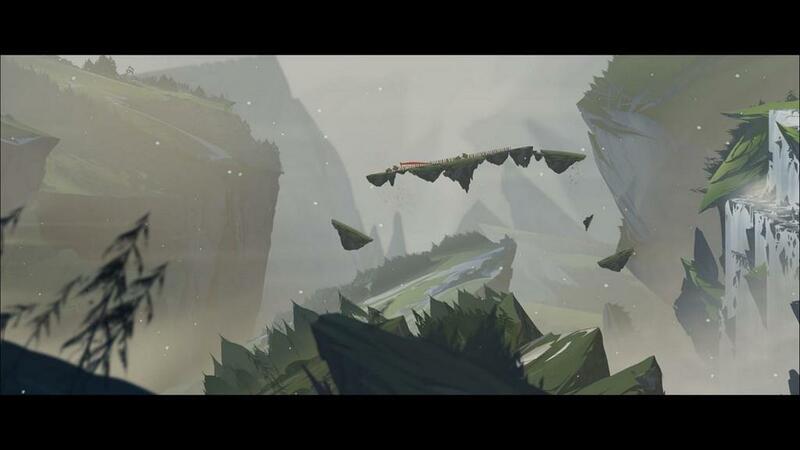 Get here now, Banner Saga 3.